One of my favourite books is The Computational Beauty of Nature by Gary William Flake where there is a fantastic chapter about fractals in which I discovered the L-Systems. L-Systems were conceived in 1968 by Aristide Lindenmayer, a Hungarian biologist, as a mathematical description of plant growth. Apart from the Wikipedia, there are many places on the Internet where you can read about them. If you are interested, don’t miss The Algorithmic Beauty of Plants, an awesome book by Przemysław Prusinkiewicz that you can obtain here for free. Roughly speaking, a L-System is a very efficient way to make drawings. In its simplest way consists in two different actions: draw a straigh line and change the angle. This is just what you need, for example, to draw a square: draw a straigh line of any length, turn 90 degrees (without drawing), draw another straigh line of the same length, turn 90 degrees in the same direction, draw, turn and draw again. Denoting F as the action of drawing a line of length d and + as turning 90 degrees right, the whole process to draw a square can be represented as F+F+F+F. And what if you change the matrix exponent? And what if you apply polar coordinates? 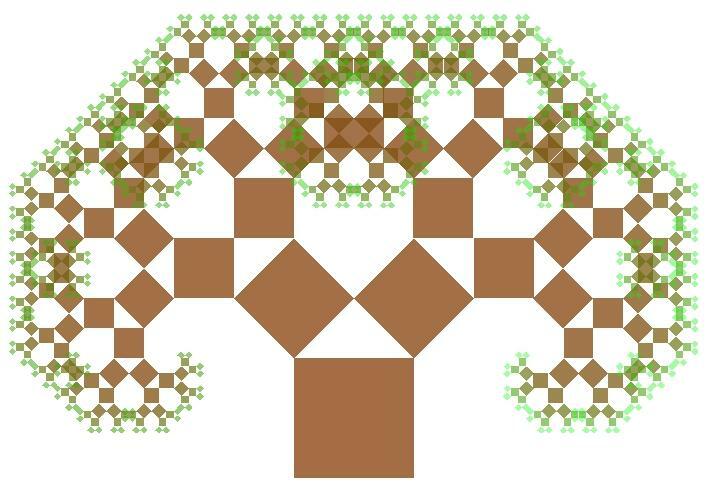 How beautiful is this fractal! 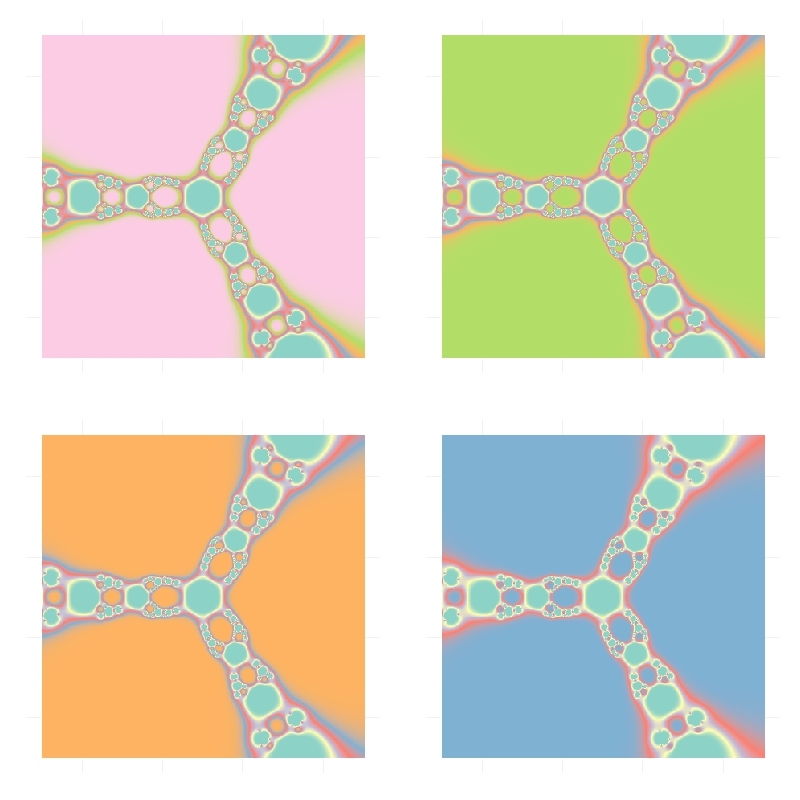 In previous posts I colored plots using module of complex numbers generated after some iterations. In this occasion I have used the escape-time algorithm, a very well known coloring algorithm which is very easy to implement in R.
Those who want to know more about this fractal can go here. For coloring, I chose a simple scale from red to yellow resulting a fractal interpretation of my country’s flag. You can choose another scale or use a RColorBrewer palette as I did in this previous post. Choosing another x or y ranges you can zoom particular areas of the fractal. Try yourself and send me your pictures! ## Supressing texts, titles, ticks, background and legend. 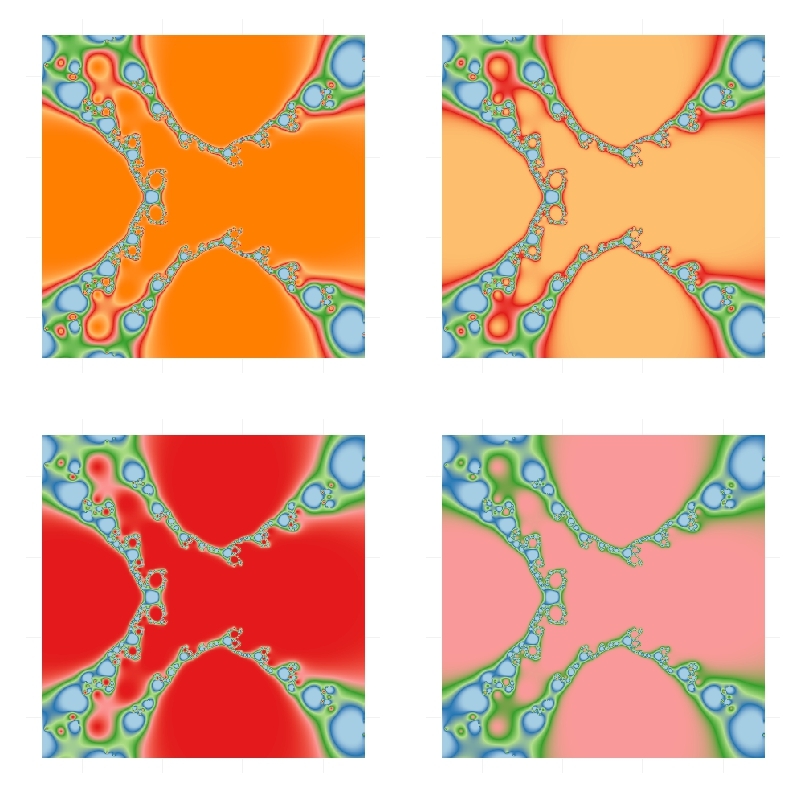 Newton basin fractals are the result of iterating Newton’s method to find roots of a polynomial over the complex plane. It maybe sound a bit complicated but is actually quite simple to understand. Those who would like to read some more about Newton basin fractals can visit this page. I generated 120 images and gathered in this video to make the wind happen. The stunning song is called Kothbiro performed by Ayub Ogada. I like the concept of sonification: translating data into sounds. There is a huge amount of contents in the Internet about this technique and there are several packages in R to help you to sonificate your data. Maybe one of the most accessible is tuneR, the one I choosed for this experiment. Do not forget to have a look to playitbyr: a package that allows you to listen to a data.frame in R by mapping columns onto sonic parameters, creating an auditory graph, as you can find in its website. It has a very similar syntaxis to ggplot. I will try to post something about playitbyr in the future. 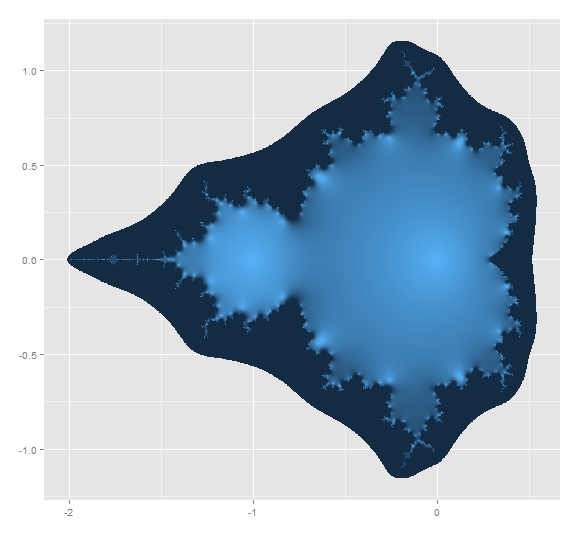 Let me start plotting the Mandelbrot Set. 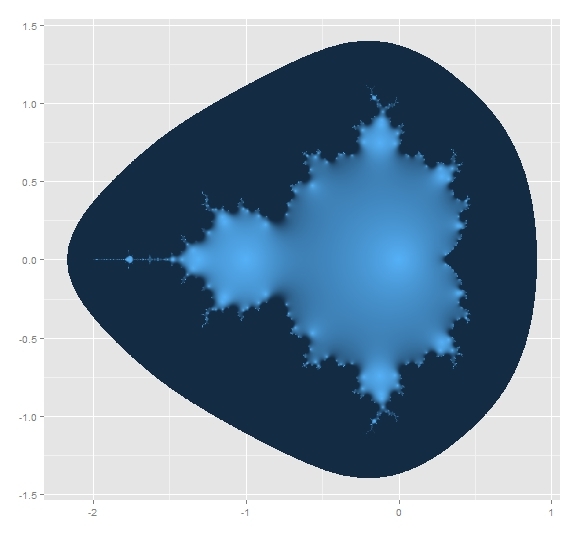 I know you have seen it lot of times but it is very easy to plot in with R and result is extremely beautiful. Here you have four images corresponding to 12, 13, 14 and 15 iterations of the set’s generator. I like a lot how the dark blue halo around the Set evaporates as number of iterations increases. 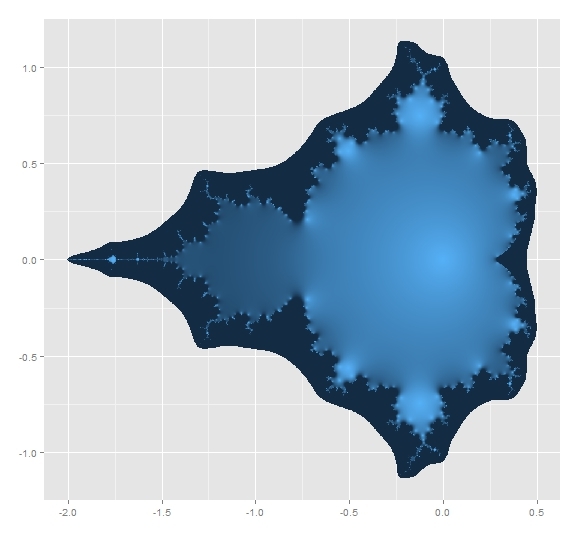 Mandelbrot Set is generated by the recursive formula xt+1=xt2+c, with x0=0. A complex number c belongs to the Mandelbrot Set if its module after infinite iterations is finite. It is not possible to iterate a infinite number of times so every representation of Mandelbrot Set is just an approximation for a usually big amount of iterations. 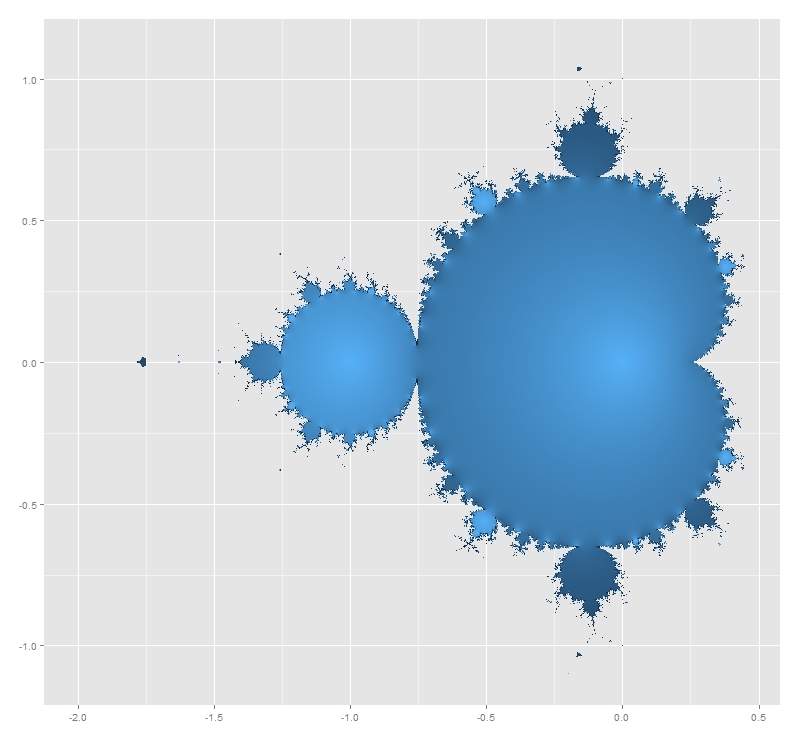 First image of Mandelbrot Set was generated in 1978 by Robert W. Brooks and Peter Matelski. You can find it here. I do not know how long it took to obtain it but you will spend only a couple of minutes to generate the ones you have seen before. It is amazing how computers have changed in this time! This iterative equation is diabolical. To see just how pathological is, I transformed the succession of modules of xt generated by a given c in a succession of sounds. Since it is known that if one of this iterated complex numbers exceeds 2 in module then it is not in the Mandelbrot Set, frequencies of these sounds are bounded between 280 Hz (when module is equal to zero) and 1046 Hz (when module is equal or greater to 2). I called this function CreateSound. Besides the initial complex, you can choose how many notes and how long you want for your composition. -1+0i gives the sequence 0, −1, 0, −1, 0 … which is bounded. Translated into music it sounds like an ambulance siren. 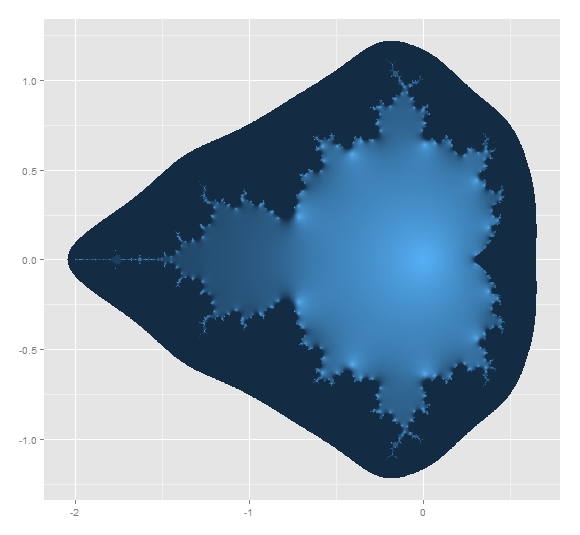 -0.1528+1.0397i that is one of the generalized Feigenbaum points, around the Mandelbrot Set is conjetured to be self-similar. It sounds as a kind of Greek tonoi. -3/4+0.01i which presents a crazy slow divergence. 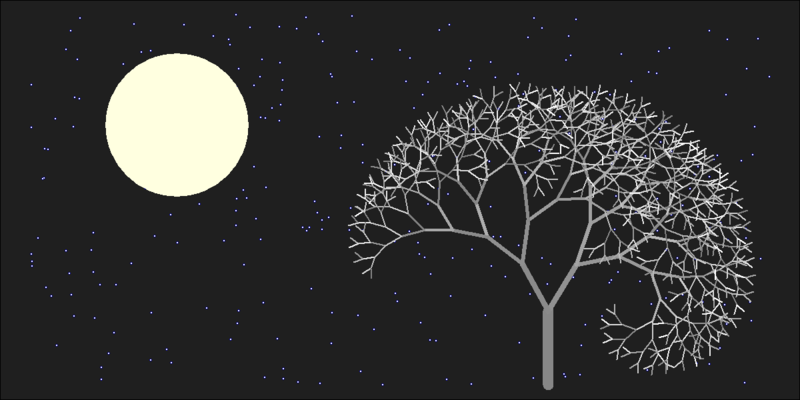 I wrote a post some weeks ago about this special numbers around the neck of Mandelbrot Set and its relationship with PI. All examples are ten seconds length. Take care with the size of the WAV file when you increase duration. You can create your own music files with the code below. If you want to download my example files, you can do it here. If you discover something interesting, please let me know.